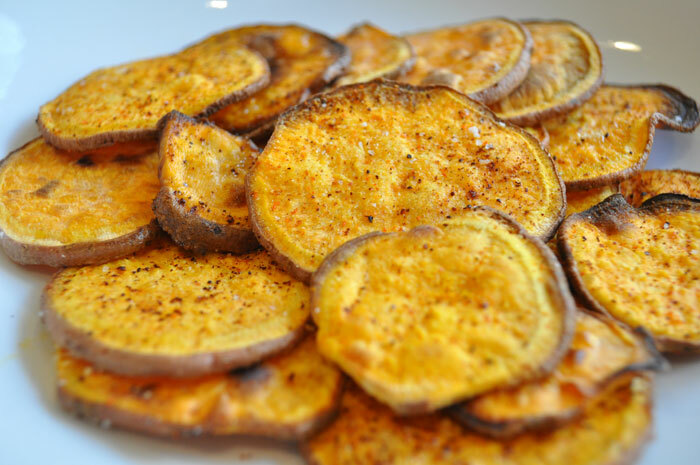 Great snack or side dish! Preheat over to 400. Spray baking sheet or line with parchment. Thinly slice potoato- you can do this by hand, but I found the food processor slicing tool worked best to get even pieces. They should be no more than 1/8 inch thick. Arrange slices on baking sheets so they don’t overlap. Coat each one with a bit of olive oil (brush on or spray) and sprinkle with salt. Bake chips until they begin to brown, about 15 minutes. Remove from oven and sprinkle lightly with spices, to taste. Cool on a rack.